The first week of 2016 started with a big move down in equity prices as a result of geopolitical events in emerging markets and fears of slowing economies worldwide. However, these and other reasons ignor the larger trends influencing markets today. Understanding today’s market-moves requires the study of market history and secular trends that dominate market direction. Most investors are unaware of secular bull and bear markets that control long-term direction of markets for significate periods of time. It is important to remember that the stock market is an auction system made up of millions of investors interacting electronically to achieve the best results for their efforts. People are emotional by nature, often influenced by both the fear of losing wealth and the greed of not attainting enough wealth; as a result, overbidding for desired stocks will push markets to much higher highs years before ending Bull markets and beginning the Bear markets that follow. There are, of course, other contributing factors, but most secular market trends are driven by the basic human emotions of fear and greed. If you accept the existence of secular market trends, then the question is: where are we in 2016? To understand the answer to this question, let’s review the Bear market that began in the year 2000. The bear market began in March of 2000 after one of the greatest bull markets in history (1982-2000); giving investors a 1099% return if they invested in the S&P 500 for that period of time. 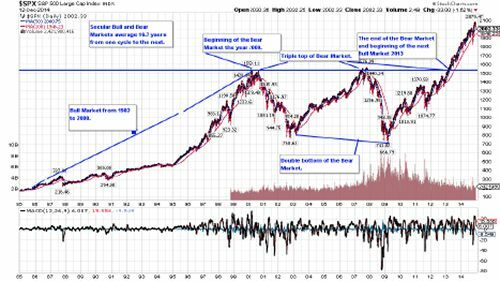 The Bear market of 2000 began with the busting of the dot com bubble and the S&P500 falling in value until October of 2002 with the final low reached in March of 2003 before rising in value for the next four and a half years until October of 2007. The market fell again until March of 2009 before starting its rise to current levels with the market highs reached in May of 2015. The chart shows the beginning and the end of the secular bear market by illustrating the price action of the S&P500 over the 14 year period; but, more importantly, it demonstrates the basic principal of economics: if you have more sellers than buyers in the market, markets will go down; and the reverse is true that if you have more buyers than sellers in the market, it will go up. We believe the market has begun the next secular bull market that will last another 15 to 20 years. We live in a time of the 24 hour news cycle, in which information that used to be interesting only to professionals is now packaged and highlighted with great graphics and music to investors with sensational entertainment values– and yes, this might make good television, but it does not make good investors. Enjoy the ride because it’s going to be a long one.